This is probably the one task that inspires the most fear and reluctance in new dog owners, but it doesn't have to be so stressful. Crate training is one of the more widely recommended methods for apartment dogs. This technique takes advantage of the fact that dogs are reluctant to go where they sleep. Be sure to set up the crate as a place of comfort, not a punishment. You may find it easier to designate an out-of-the-way area and place potty pads on the floor. The spot should be a good distance away from your dog's food and water dishes. Whichever method you choose, it doesn't replace regular outdoor potty breaks. Take your dog out as soon as you get home, and create a schedule based on his/her internal timetable. With puppies, the rule of thumb is their age in months plus one equals the number of hours they can hold their bladder. If you'll be gone for longer than that, make arrangements for a relative, neighbor or pet-sitter to come by. Fortunately, all apartments in our Springs communities have private entries, so you don't have to deal with a lot of foot traffic. If your dog is easily excited by outdoor passers-by, enlist a friend for some positive reinforcement. Have him or her walk past your window several times and reward your dog with a treat each time he successfully restrains himself. Our on-site leash-free dog parks are great places to help your dog learn to socialize with others. The parks provide a neutral ground where dogs don't feel obligated to protect their turf. Keep a careful eye on your pet, especially during the first few visits when you can get a feel for your dog's social style and learn his body language. Caring for a dog is a daily commitment. In addition to potty breaks, spend regular quality time with your pet, playing games or just snuggling. A secure, well-loved dog is less likely to act out with poor behavior. 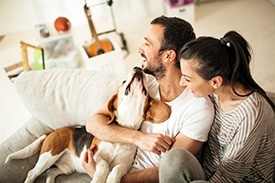 Be fair to yourself and your pet by choosing a breed that's well-suited for apartment living. Our Springs communities allow most popular breeds, including some larger ones, so you have plenty of flexibility in making a selection. Don't hesitate to talk to a member of our on-site management team if you have any questions!